From the bestselling author of Vegan in 7. Rita Serano is a hugely popular food blogger known for her irresistible vegan recipes. 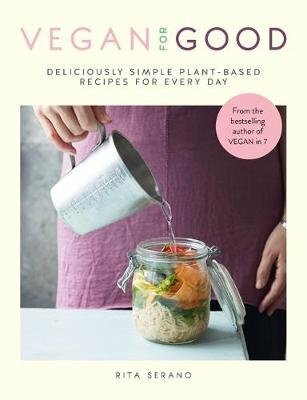 A perfect companion for busy lives, Vegan for Good contains a range of multi-functional dishes to ensure vegan meals are easy to make every day. Whether it's cooking a hassle-free weeknight supper, preparing a quick work lunch for the day ahead or treating yourself to a relaxed weekend brunch, this book has it covered. Chapters are split into Weekends, Weekends, No Time At All and Sweet Celebrations, with recipes ranging from a warming Sweet Potato and Peanut Soup to a smooth Raspberry and Coconut Cheesecake to share with friends. Packed full of flavour, colour and style, Vegan for Good has something for everyone, whether you need to whip up a 10-minute meal or spend an hour or two on a Sunday prepping for the week ahead. With Rita's friendly guidance and delicious recipes, learn how to create easy, wholesome vegan masterpieces every day.